In your eyes, I can see my own soul… You`re my world! No matter what happens if everything is good in my world. You are my reason to live and my world. 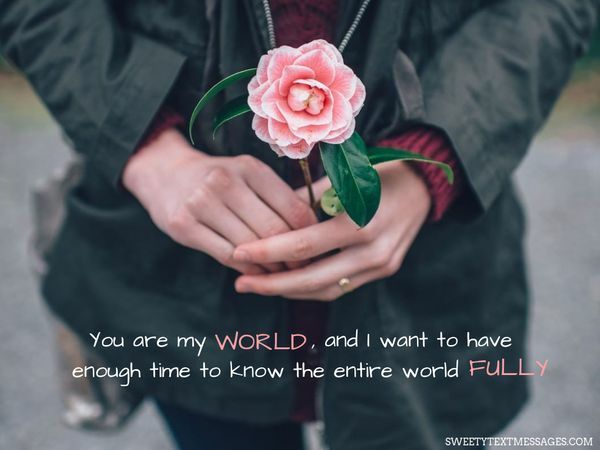 You are my world, and I want to have enough time to know the entire world fully. My favorite place to visit is always near with you. You`re the whole world for me. To find the sense of life is the blessing, but meeting the person who will become your world is even a bigger one. I am lucky to do this! I don`t need to go far away to see the world. My world is always with me when I stay with you. You are the source of my life, and you are also my life itself. You are the reason to live in this world, and you are the world itself.